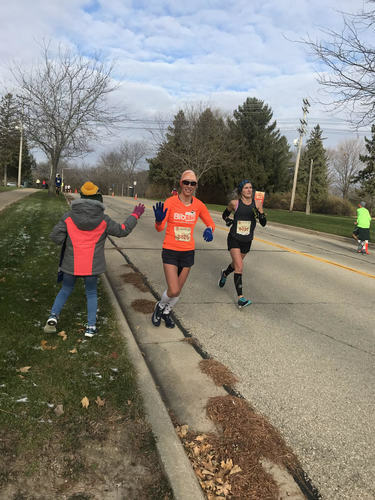 "The Madison Marathon Showcases An Awesome Wisconsin City!" 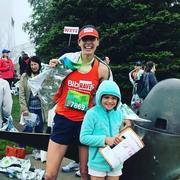 Disclaimer: I ran the Madison Marathon as a BibRave Pro, which means my race entry fee was covered in exchange for social media promotion and reviewing the race! I was excited to run Madison Marathon in 2018. I knew from friends that the course would be challenging, and that the weather in November in Wisconsin would be cool. The 2018 race proved to be both! While my time was not the greatest, I did enjoy this race. Logistics: My family and I stayed at the Hyatt Place hotel, which was a short walk to the start/finish area. Everything was very well organized and easy to get to. I should say that I went to college at UW Madison so am very familiar with Madison. My family was able to see me in several different spots along the course and they said this was not challenging to do. I loved that the start and finish were at the same place, the capitol. This made race morning very easy to deal with. Expo: The expo packet pickup was the day before, located in the Monona Terrace. The expo was easy to navigate and did not feel as crammed as expos usually feel. The race had a banner for all expo attendees to sign and thank a veteran. My kids and I had a great time with that. T-Shirts/SWAG: I love the t-shirts. They are a soft cotton long sleeve black shirt with a very cool graphic design on the front. They fit beautifully. The medals also are really nice - this race is doing those puzzle medals - where if you run the race several years in a row, your medals will form a puzzle. The race also does free race photos, which is one of my favorite amenities races can do! Aid Stations: The aid stations were well placed and well supplied, although I only used them for water cups. It was so cold that the water in cups started freezing! The finish line food was great - bananas, oranges, bottles of water, a Panera lunch, including a sandwich, cookie and bag of chips, and a Michelob Ultra beer. They did a nice job of having plenty of porta potties at the start/finish area. Course: The course is great, and very challenging. I really liked how they did a figure-8 style course including the arboretum, bike paths, UW Madison campus, Tenney park, Warner Park, and Maple Bluff. There are a LOT of hills. This is a good course to challenge yourself with! Elevation: The elevation is no joke. Strava showed a 1,240 foot elevation gain over the course. Race Management: This year was the 24th year of the race. Volunteers were great and the course was well marked. Emails leading up to the race were clear and easy to follow and had good graphics. I thought the course map in particular was nice. I really liked the alignment with Veterans Day. The race gave us "Thank you for your service" buttons to wear and veterans who ran were easily identifiable with a USA flag on their race bib. Overall, this is a well organized, easy to navigate race experience showcasing a great Midwestern city! Logistics: My family and I stayed at the Madison Concourse Hotel, which was within easy walking distance to the start/finish area. The expo packet pickup was the night before, which I generally am not a fan of because I would have opted to not stay over Friday night if I could have gotten my packet on race day. Everything was very well organized and easy to get to. I should say that I went to college at UW Madison so am very familiar with Madison. Expo: The expo was fine. Very small, but easy to get in and out of. T-Shirts/SWAG: I love the t-shirts. They offered a women's cut and a cute vintage-looking design. The t-shirt itself is very soft. One of my favorite race shirts. The medals are pretty and can be used as a bottle opener. The race-medal-as-bottle opener feels a little gimmicky at this point. Does anyone actually use their race medal as a bottle opener? Participants also received a free beer at the finish. The finish line party is held at the Memorial Union, which is a perfect venue for an event like this. Also, free race photos!!!!! Aid Stations: The aid stations were well placed and well supplied. Most of the volunteer groups that worked at an aid station gave their aid station a theme so that was really fun because they went all out! My favorite aid station was the swimming team around mile 9ish. Course: The course is fantastic, especially for a UW Madison alum who loves coming back to visit! The start and finish line were close to each other making logistics and spectating easy. I liked how the course was a mix of roads/urban and trails/woods. It was very well laid out. Elevation: There are some hills but nothing crazy. I enjoyed the elevation change. Race Management: This year was the 10th annual Madison Mini and worked like a well-oiled machine. I have no complaints. Volunteers were spectacular and easy to spot with their coordinated yellow t-shirts and everything was well marked. Emails leading up to the race were clear and easy to follow. My kids participated in the kids run and had a blast and of course we all loved meeting Bucky Badger. Can't wait to run this one again! There is a reason that so many people told me "Grandma's Marathon is on my bucket list". If it's not on yours, you need to add it. I ran a PR race here this year which likely influences my thoughts on the race, but I truly think that even if my time wasn't a PR, I would have loved it. Logistics: I had heard that lodging can be difficult so best to secure this as early as possible. We stayed at the Comfort Inn West which did a great job accommodating the runners. They had refrigerated water bottles, rain ponchos and granola bars available at all times and the staff wore green Grandma's Marathon t-shirts all weekend. The best part was that this hotel was one of the shuttle locations to take to the start. All I had to do on Saturday morning was wake up, get dressed and walk out my hotel to board a shuttle. The race also has a train that you can take to the start, which I might do in future years. Expo: I had to take my two young kids to the expo with me and we all had a good time, except it was fairly crowded, as all Expos seem to be. You had to pay $5 to park at the expo location. Packet pickup was very efficient. There were a lot of high quality vendors at the expo. T-Shirts/SWAG: The finisher shirt is awesome - and you have to finish to get it. They have women's cut and men's cut shirts, and the sizing was good. (Sometimes I find that the women's cut shirts don't fit me very well - not so with these.) The medals are also very nice - they are heavy and showcase the amazing pine trees that line most of the course. Aid Stations: The aid stations were well placed and well supplied. Volunteers were amazing. I liked that they had the water and powerade clearly marked and on both sides of the course which made it easy to grab and go. I had looked what the sports drink was going to be prior to the race and am not a fan of Powerade but because I knew that was what was going to be supplied, I could make accommodations. Course: The course is gorgeous. Very rural and tree-lined for the majority of the race, with sporadic views of Lake Superior. There are many images from this course burned in my memory but one thing that I wasn't anticipating is the smell. Around mile 7, I loudly announced, "You can smell pine trees!!!" . It was incredible. Also, even though it is rural, there are plenty of spectators cheering for you the whole way. Duluth really comes out to support their marathon! The course had to be re-routed this year due to construction so I don't know what the last few miles normally are like, but the detour seemed fine to me. Elevation: This is a net downhill course, with some rolling throughout. Nothing really felt like a hill. There is "Lemon Drop hill" around mile 24 (I think) which didn't feel great running up, but was more of a blip than a hill. If it was placed earlier in the course, you wouldn't even feel it. Race Management: This year was the 42nd annual Grandma's Marathon and clearly they have the race management down. I experienced no difficulties with any part of this race. The morning shuttle driver did miss our drop off, which made our bus have to walk a bit more to get to the start, but nothing crazy. The porta potty configuration was a little weird and resulted in some line confusion. I loved that I could take my gear with me to the start and gear check it at the start. They gave you a clear bag which you placed a color-coded numbered sticker on and dropped it in a trash can with your color. Could not have been easier! The miles were very clearly marked with these huge balloons, that were fun to hunt down. The tracking app worked beautifully - I had many friends and family tracking me and based on the text messages I had on my phone when I powered it on after the race, it worked just fine for them! The finish line snacks were great and I liked that you got a beverage ticket so you could choose what beverage you could get (I opted for the coffee). Bananas, fresh strawberries, Clif bars, chocolate milk, fresh OJ, water was all plentiful. Oh! And potato chips!!! I have never had potato chips after a race and I am now going to start. YUM. Thank you Duluth and Grandma's Marathon for an incredible race. I will for sure be back! I ran this race last year, had a great time, so I signed up again this year. After I signed up, the race changed management and names from the PNC Milwaukee Running Festival to the PNC Milwaukee Marathon. Parking: A big deal was made about parking on social media before the race. I did not choose any of the pre-pay/reserved options that were available as I assumed that I would be able to find a street spot on a Sunday morning if I left my house early enough. I was not wrong. I easily found a street spot on 2nd Street not far from race start. I had some trouble getting back to my car after the race because of where the course was blocked off but it wasn't terrible. Expo: I had to take my two young kids to the expo with me and we all had a good time, except it was fairly crowded. The set up was still at the Harley-Davidson museum but in a different building so it seemed better organized than 2016. I still think they could benefit from having more space in the aisles. I thought the variety of vendors was better this year than last. T-Shirts/SWAG: The finisher shirt is awesome. I typically order a man's small sized shirt because I find that the "women's cut" are always super tiny but not here. I liked the sizing and the design of the shirt. 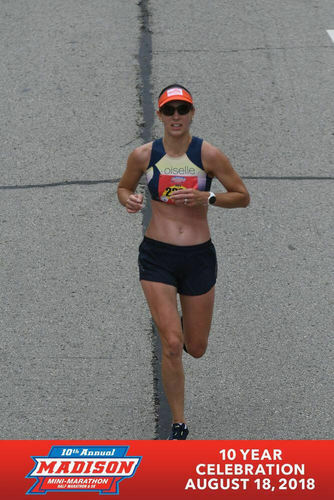 The race also included a Milwaukee Brewing Company beer for all finishers. Last year they had a Coors beer and I was wishing they had included a local brewery so I was super happy to see this change. Great beer vendor!! Finally, the medals for this race were awesome. I really liked the design and that everyone had the same medal with different neck ribbons by color to designate the distance you participated in. Aid Stations: The aid stations were well placed and well supplied. Volunteers were amazing. Course: I liked this course a lot. I thought it offered a lot of variation and enough change that you were not bored. Elevation: There was a bigger hill around mile 5, where Lincoln Memorial Drive turns into Lake Drive. Running west on Wisconsin Avenue is a slight uphill which feels harder because of the placement around mile 10. Race Management: It seemed to go ok. I would like to see starting corrals by time put into place and I really did not like starting with the finisher chute tables in the way. The starting area was already quite narrow and it didn't help that you had to look out for the tables and that it was still dark at the start. I think the idea of having the start/finish be at the Yards seemed ok except, like last year, if there is any rain in the days leading up to the event (or during the event), the entire post-race party ends up being a giant mud pit. It seemed that the finish line tent areas were sort of half-assed put together; for example, the women's changing tent still had flaps unsecured so during big wind gusts, the flaps would fly open. Gear check was easy to use. The amount of porta potties was adequate. I liked that the food trucks and kids activities were at the finish. Unfortunately, the weather was not conducive to sticking around very long to participate in the post-race party, which is not in the management control. I noticed a lot of photographers along the course and while I haven't seen my photos yet, I know that they are free. I think the free race photos option is always a nice inclusion. One thing I was disappointed in is the time we had to wait for results. At this event last year, there was a results tent where you could get a printout of your results data right after your finished. This was awesome. Official results were not available until early afternoon of race day, by which time I was already home. I would love to seem them bring back the race printout technology that they had in 2016. Overall, I think this is a great half marathon course! 2017 was my second year in a row doing this race. It has a fun hometown feel and people are obviously passionate about the bacon. Parking: Parking is very easy. You have to find a street spot along Sheridan Park. Both years that I ran, I came from work (read: early) and had ample opportunities. Expo: Not applicable. I picked up my race packet at the race. It was very easy and streamlined. T-Shirts/SWAG: The shirts for this race are classic cotton t-shirts with a new design every year. This year's design was ok. People it seems like collecting them, though! Also included in the packet are a coupon for Patrick Cudahy Bacon and a coupon for Performance Running Outfitters. Every finisher gets a package of bacon as well. bacon. You can actually smell bacon cooking as you approach it, which may be a positive or negative for you. Course: The course has the same start and finish line in Sheridan Park. Runners run south and then turn and head north on Lake Drive for a while and then turn to run on the Oak Leaf Trail. There is a wide section of street blocked off on Lake Drive. Cones and volunteers were plentiful directing you where to go. Elevation: Some small inclines, but overall flat. Race Management: Overall the race was managed well. For a small, hometown race, there are lots of fun perks. The post-race party features a live band, a boxed meal featuring a ham sandwich, two pasta salads, a bag of chips and a cookie AND a beverage from Sprecher Brewery. There are no medals. Top 3 males and top 3 females went home with a cooler full of, you guessed it, bacon and performance running outfitters gift certificates and age group winners get a coupon for a free package of, you guessed it, bacon. 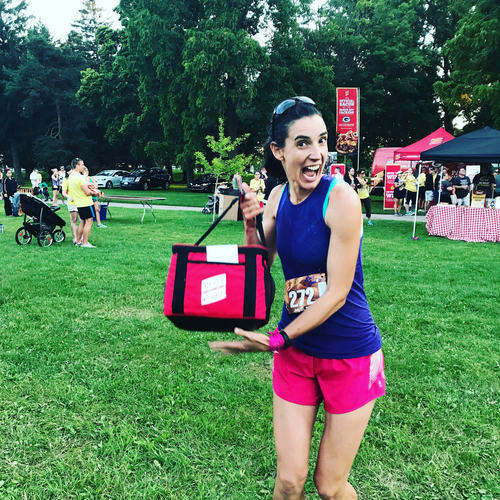 If you love bacon AND running, this is the perfect race for you!